Nicolas Sanson was born on the 20th of December in 1600 in Abbeville, France. He was a French cartographer, termed by some the creator of French geography, in which he's been called the "father of French cartography." Sanson was born of an old Picardy family of Scottish descent. He was educated by the Jesuits at Amiens. In 1627 he attracted the attention of Richelieu by a map of Gaul which he... Read moreNicolas Sanson was born on the 20th of December in 1600 in Abbeville, France. He was a French cartographer, termed by some the creator of French geography, in which he's been called the "father of French cartography." Sanson was born of an old Picardy family of Scottish descent. He was educated by the Jesuits at Amiens. He gave lessons in geography both to Louis XIII and to Louis XIV; and when Louis XIII, it is said, came to Abbeville, he preferred to be the guest of Sanson (then employed on the fortifications), instead of occupying the lodgings provided by the town. At the conclusion of this visit the king made Sanson a councillor of state. Sanson issued his first map of importance, the "Postes de France", which was published by Melchior Tavernier in 1632. 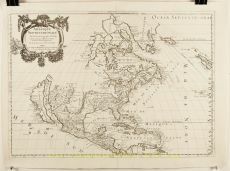 After publishing several general atlases himself he became the associate of Pierre Mariette, a publisher of prints. In 1647 Sanson accused the Jesuit Philippe Labbe of plagiarizing him in his Pharus Galliae Antiquae; in 1648 he lost his eldest son Nicolas, killed during the Fronde. Among the friends of his later years was the great Condé. His two younger sons Adrien (d. 1708) and Guillaume (d. 1703), succeeded him as geographers to the king. He died in Paris on 7 July 1667.